Soon there will be a continuous northbound protected bike lane along the length of First Avenue, from Houston Street to the Harlem River. On Monday, the Manhattan Community Board 6 transportation committee voted for DOT’s plan to plug the critical gaps in physical protection near the United Nations and the approach to the Queensboro Bridge [PDF]. From 55th to 59th Streets the First Avenue bike route currently consists of sharrows, and between 47th Street and 48th Street there is no physical protection. The new project would protect those five blocks. At the intersections of 57th Street and 59th Street, cyclists and drivers turning across the bike lane would have separate signal phases to eliminate conflicts. In addition to creating a safer bike route, the redesign will shorten crossing distances for pedestrians. The sharrows on this part of First Avenue were not keeping people safe. On the four blocks from 55th to 59th, one cyclist and three pedestrians were severely injured, and three pedestrians were killed between 2010 and 2014. DOT announced its intention to close what was then a 10-block gap in the First Avenue protected lane last May. The project was supposed to happen in two phases in quick succession, starting in the summer. But the first phase was delayed until the fall, and the second phase didn’t get off the ground until this year. 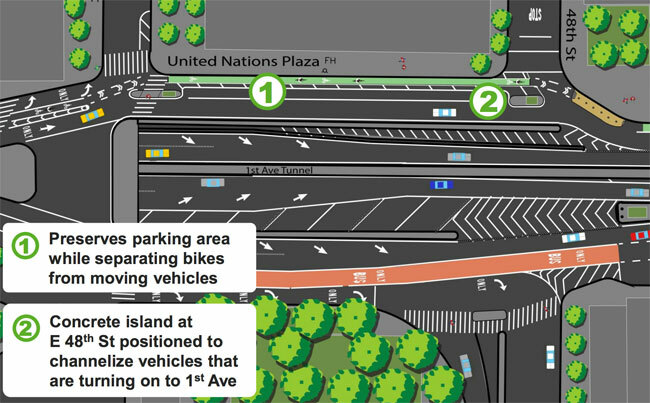 In addition to closing the gap from 55th to 59th, DOT’s plan resolves flaws in the design by United Nations Plaza. Motorists frequently ignore the bike lane between 47th and 48th, which is only separated from traffic by a painted buffer. There were multiple pedestrian and cyclist injuries at those intersections between 2010 and 2014, according to DOT. Over on Second Avenue, meanwhile, the southbound complement to the First Avenue bike lane remains very much incomplete. In March, DOT Manhattan community liaison Colleen Chattergoon told CB 6 the city would present a protected bike lane proposal for Second Avenue between 43rd Street and 59th Street in May or June. A DOT spokesperson said today that the plan is on track to be presented this month. Coupled with the protected lane above 68th Street that’s set to be installed subway construction wraps up, that would leave the nine blocks between 68th and 59th Street unprotected, as well as the nine blocks between 43rd and 34th Street. Those areas are particularly treacherous for cyclists, who must contend with heavy Queensboro Bridge and Queens Midtown Tunnel car traffic. 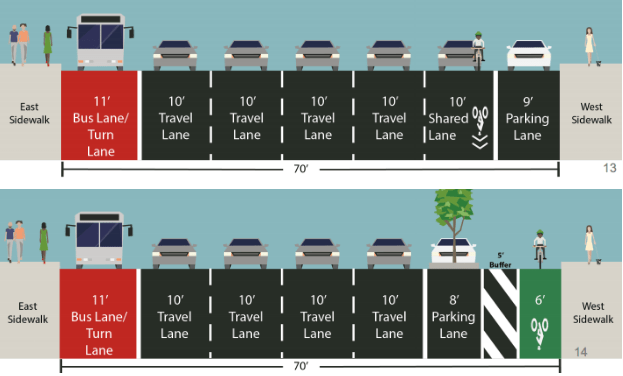 You can testify for the First Avenue project — and for improvements on Second Avenue — at tonight’s CB 6 full board meeting, which begins at 7 p.m. in Alumni Hall A at the NYU Langone Medical Center, 550 First Avenue. I’m curious. When exactly will the DOT reconfigure 1st Ave just south of the Willis Ave Bridge. I know the plan was approved, but when? Separate turn phases on 57th and 59th will probably mean I stop using this bike lane. As it stands, the split-phase at 55th is mostly useless. I’m a fast cyclist, but I can’t get from a green on 53rd to the green bike light on 55th without risking a pedestrian or cyclist collision. Drivers consistently get the flashing yellow arrow before I get there, meaning I have to either risk that they know what a flashing yellow arrow means (ha) or go around their right, in usual mixing-zone fashion. Assuming that kind of half-assed synchronization holds up with the split phases on 57th and 59th, that seems like two guaranteed stoplights just trying to go straight for five blocks, while car traffic whizzes by. Guess I’ll start trying my luck on Park and 3rd. Certainly a nice improvement, but still concerned about the path at 48th and 1st where the lanes slightly turn/shift (the yellow section in the diagram). Drivers constantly go through the bike lane there because they can’t stay in their lane, they just drift over without ever looking. So many near-hits there, even sideswiped by a cab once. The island being added there doesn’t seem to properly handle it as there is still a lane shift. 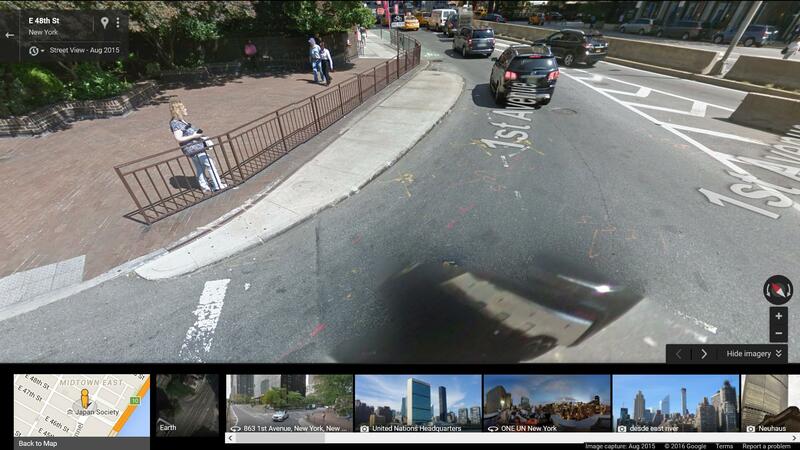 And what about the centrally located bicycle lane on the hill between E 41st and 42nd Sts? I would hope that the DOT is shifting the lane to a position along the curb with flex bollards and a separate signal. Same situation between E 46th and E 47th Sts, sans uphill. This should be fixed for people needing access to/from 42nd-48th streets but I think they should also take the left lane in the tunnel for bikes. There are two lanes in the lefthand tunnel that merge to one (seen above), so this doesn’t cost any capacity. I already do this now to skip the whole mess but bollards and a bike lane would be fantastic. We’re still not trying particularly hard to enable low-stress cycling. It seems like despite the headline, there are going to be a few gaps. These are worse than the mixing zones from a stress/risk standpoint and really are leaving a Class II gap in the Class III protected lane. The era of high stress east side cycling is definitely not over if you have to go back downtown. Interesting use of the first person plural. Are you a designer at DOT? No, I mean “we” as in “We, the People of the City of New York”. This! Second Avenue will still be a meat grinder by the tunnel and by the bridge. I’ve only attempted this once during the UN security freeze and I was terrified a car would come up behind me. Totally agree that the left lane of the tunnel would be an amazing express bike path. Thanks for the good news, I was just thinking about this during my morning commute. Not an option, Vooch, and you know it. Please stop peddling this nonsense. then truely the PBL Is not the right place to cycle. Great, thanks. I really appreciate being told I don’t deserve the protection of designated cycling infrastructure because I’m capable of biking at near-traffic speed. Like I said, I’ll try my luck on 3rd or Park. Hope I don’t die – not that you care. The ones in the Netherlands are. 30 kph is the minimum design speed in urban areas, and 40 kph in non-urban areas. Typically most bikeways will exceed these standards. Bike infrastructure should be useable by cyclists of all abilities. They should build little flyover bridges for cyclists (a la copenhagen) at these two areas. They should really do that over every major cross street. My idea is to keep the bike lane level and sink the turn lanes under it (though this would presumably be a lot more expensive). Theyre going downhill already after that left turn. I was thinking the same thing. They need Jersey Barriers or at least flexible deliniators between 48th and were the parking buffer begins. Same on Vanderbilt just south of Fulton in Brooklyn. that one is CRAZY! i’ve almost been killed there numerous times. The sign there annoys me most, “Bicycles Watch for Cars.” Bikes are going straight, motor vehicles are the ones changing lanes, but I don’t see any sign alerting them to yield. Seriously, that’s one of the WORST. That design is begging for crashes, as car take that turn at speed. This design would NEVER be used in the Netherlands. Ideally, we will design for faster cyclists as well. Given the political realities (poor design guides + weak willed politicians + limited funding) we’re still taking what we get. There is a balance to be had in not making the perfect the enemy of the good, but also continuing to push for better. Better designs do exist, but they require money and political support. Keep pushing for them, Simon (I’m right there with you! ), just don’t kill good (but not great) projects in the process. The NYC PBLs simply are not designed for even 30km cycling, more like 20km cycling. I’m not really making the “perfect” the enemy of the “good” here. I’m not even particularly complaining about the lane not accommodating speeds at which I’m capable of traveling. I’m just noting that the DOT seems inclined to time the bike lights on this stretch according to car traffic speeds, not bikes, so that virtually everyone in the bike lane misses them if they’re traveling at safe speeds. So – what’s the point? Wait a minute! I like that configuration. Being to the right of left-turning cars is much better than being subject to the left hook. We should have a similar thing up at 57th Street; I’d prefer to have the bike lane painted to the right of the two left-turning lanes. I am pretty sure that I have seen the analogous configuration on the other side — a bike lane to the left of right-turning cars — in Philadelphia. I wish I could remember the exact location. Anyway, the concept is a good one. Ah, yes. Another good one. oh yeah, the signal progression is a huge problem everywhere, since it makes ALL cyclists hit red lights every few blocks. DOT could easily make a massive green wave at 16 mph up and down all the avenues. It would improve safety for everyone and likely not make a huge impact on car travel times. Again, though, it takes political will to do so. Also, I’m a huge critic of DOT’s designs for a long time, so I’m with you. They are replicating mediocre designs across the city. Agree completely. Current light timing either encourages cyclists to ride faster then is probably appropriate for the PBLs or they will hit red lights every couple of blocks. The redesign put cyclists on the curb extension. With the fence it doesn’t look like people are supposed to walk there. Not sure why the picture in the article directs the bike lane there but a later picture has an ADA mat though. Drivers go through where the bike lane is now, not where it’s being moved to. This actually seems to solve the problem. That mountable curb extension just doesn’t seem to work. The 90 degree turns on it seems absurd, but also look at the ‘exit’ in the red circle. 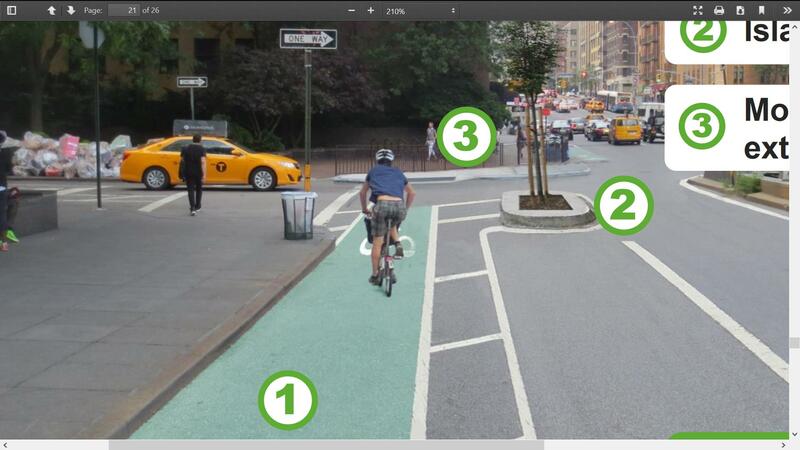 Seems to overlap the bike lane by a foot and clearly no ramp in the rendering. Appears to make it worse since you can’t safely use the curb extension and by putting the bike lane on the curb side leading up to it, it makes it more dangerous to go around the extension due to shifting lanes. I suspect they’ll ramp the extension but there’s still unaddressed intrusion beyond the extension because it’s at the apex of the corner. The curbside lane that follows is very narrow and unprotected next to a highway-spec car lane. Not quite up to the standards of the rest of 1st Ave. The left hook is not as big of a problem in a mixing zone configuration (and not at all a problem in a split phase configuration) as being hit while crossing over what is essentially a highway ramp to the unprotected lane is in this design. Yep. And the drivers coming to the 57th turn lanes treat it exactly like a highway ramp. that the intrusion problem will be gone. Look at the streetview again, the cars are where the bike lane is now. They aren’t on the section between the concrete curb extension and the painted bike lane. Express bike path would be nice until you get to the end of the tunnel where you’re left between two motor vehicle lanes. In practice traffic is usually stopped when I get to the end of the tunnel. It’s a bit of an odd merge before bollards preventing tunnel traffic from making a left turn. Empirically, I feel safer in the tunnel than the surface section, with the caveat you need to monitor traffic behind.